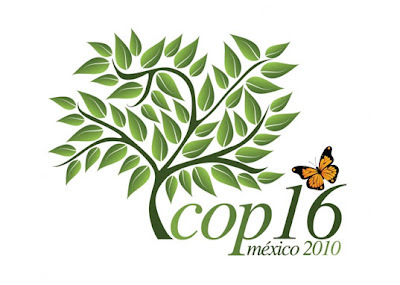 The 16th edition of the Conference of the Parties of the United Nations Framework Convention on Climate Change (COP16) and the 6th Conference of the Parties to the Kyoto Protocol (CMP) has began today in Cancun, Mexico. The 12 day conference, which will end on December 10th, aims to encourage and enhance international action against climate change. The main focus of this year's conference is to increase funding for climate adaptions programs, transferring clean and sustainable technologies to poorer, developing countries, and to protect forests from deforestation. The UN is also hoping to continue to make progress on the climate finance fund, which would give poorer nations $30 billions in order to help them cope with and adapt to climate change. This would amount in a total of $100 billion by 2020. However, poorer nations, including countries from the Pacific Island, are hoping that the fund will be confirmed during the Cancun Conference and that the UN would oversee the distribution of the funds, and no the World Bank. Unfortunately, the numbers attending the COP16 meetings are expected to be low in comparison to last year's COP15 Conference in Copenhagen. More than 45,000 people attended last year, including state world leaders, such as Barack Obama, Gordon Brown and Angela Merkel. This year, it is most likely that environment ministers, departmental delegations and senior foreign ministry officials with attend. For more information, visit the official COP16 website.